TL;DR: This post discusses how to authenticate against Auth0 in your Cypress end-to-end tests successfully. You will use a small sample React application to illustrate patterns you can use to programmatically log your user into Auth0 while running Cypress tests, in a manner that adheres to most Cypress and Auth0 best practices. To see a working example of the techniques described in this article, please feel free to clone this repo. "Learn how to perform end-to-end integration tests on SPAs secured with Auth0." You will also need to have Node.js and NPM installed. Check out the Node.js website for download links and an installation guide. You are also expected to have an Auth0 account and have valid user permissions so that you can authenticate into your application. So, if you don't have an Auth0 account yet, sign up for a free now. Lastly, a basic understanding of what Cypress is and why it’s useful is expected. If you do not know Cypress, check out this article for more. To see the whole process in action, you will need to create an Auth0 Application on your Auth0 dashboard. To do so, head to the Applications section of your dashboard and click on the Create Application button. When you click on this button, you will see a dialog. On this dialog, you will have to add a name for your application (e.g., "Cypress E2E Testing") and you will have to select Single Page Web App as its type. Scroll down to the Allowed Callback URLs field and enter in the following value: http://localhost:3000/callback. After user authentication occurs, Auth0 will only redirect successfully if the route in question is listed here. Enter http://localhost:3000 into the Allowed Web Origin field. Enter http://localhost:3000 into the Allowed Logout URLs field. Scroll down to the bottom of the Settings page and click Show Advanced Settings. Click on the Grant Types tab, and check the Password grant. Repeat Password: Enter the same password. After that, click on Save to finish the process. Lastly, you will have to go to your tenant's settings and set Username-Password-Authentication as the value of the Default Directory property. As mentioned in this page, this field defines the "name of the connection to be used for Password Grant exchanges". In this case, the Username-Password-Authentication value comes from the default the default Database Connections that Auth0 adds to all new tenants. Just don't forget to save the changes made to your tenant. Note: You can also refer to the finished product on the master branch. Then, be sure to npm install and npm run start in your terminal to spin up the application. This app will be quite simple: it is a React application with a few routes, powered by React Router 4. One of the routes will be protected — that is, only accessible for authenticated users — and the other, public. There will be one other route which serves an important purpose: the /callback route. This route is where the user is redirected after successfully entering their Auth0 credentials. When this route is hit, the application checks to ensure that the state information in the URL's query string matches the state stored in the persisted cookie. If these protected route patterns are unfamiliar to you, I highly recommend checking out Bruno Krebs' article for more. Cypress is a modern front-end testing tool that makes writing integration tests a breeze. This tool is, essentially, a one-stop shop for all your end-to-end testing needs, combining a fast, state-of-the-art testing framework, graphical and headless test runners, and easy-to-use assertion library in one package. So you’re sold on Cypress and you’re using Auth0 for your authentication needs. Now, it is time to see how you can make the two play nicely together! Imagine that you want to write a test to ensure that a user can visit a page only available behind authentication. How would you do this? The best practice is never to visit or test third-party sites over which you have no control. Then, since you don’t have control over the Auth0 website, it doesn’t make sense to try and mimic a user’s login flow through the UI. "Don't waste time covering services that you do not control on your end-to-end tests." Note: Auth0 now recommends using cookies in lieu of local storage. Not a problem. You will adhere to this recommendation in your implementation. Now that you have a strategy in place, you can get started. That's great and all, but you can imagine that having to write the code above every time you want to log in could be quite cumbersome and violate DRY (Don't Repeat Yourself) principles. Thankfully, Cypress has a feature called Custom Commands that allow you to encapsulate this code and make it reusable across your tests. Now, when you want to trigger a request to authenticate against Auth0, you simply have to call cy.login() from your code. The custom command name to use in your consuming code (in this case, login) corresponds to the first argument given to the add() method. OK, so you have your custom Cypress login command, but what's with the Cypress.env values for the keys in the body object? Because you re providing sensitive information in your Cypress request to Auth0, you need to authenticate. And, it's imperative to store this information outside of your test suite. This ensures that you do not accidentally commit any sensitive details to your Git repository. Please, do not forget this step! auth_audience: For this one, you will have to replace my_tenant.auth0.com with your own Auth0 domain (e.g., blog-samples.auth0.com). You can find this information on the Auth0 application you created before. auth_url: Here, you will have to do the same thing. You will have to replace my_tenant.auth0.com with your own Auth0 domain. auth_client_id: In this case, you will have to use the Client ID property of the Auth0 Application you created before. auth_client_secret: Lastly, for this property, you will have to use the Client Secret property of the Auth0 Application you created. For the last two properties (auth_username and auth_password) you will have to use the credentials used while creating the end-to-end testing user. Cypress isn't the only tool in your application that has to take environment variables. You will have to define environment variables for your React application as well, albeit in a different file. Rename the .env.sample file in the root of the project to simply .env. Replace the my-tenant.auth0.com value (on the REACT_APP_AUTH0_DOMAIN variable) with your tenant domain (e.g., blog-samples.auth0.com). Insert your Client ID for the REACT_APP_AUTH0_CLIENT_ID variable. Unlike the cypress.env.json file, there should be no quotes around this value here. While creating your Auth0 Application, you enabled the Password grant. But what exactly is a grant, anyway? OAuth 2.0 supports several types of grants, which are methods by which you can gain access tokens. Different grant types allow different types of access and, based on the needs of your app, some grant types are more appropriate than others. That last sentence is the key here. Normally, when authenticating with Auth0, you are redirected to log in through Auth0's hosted login page. But, since you are in a testing environment (and again, you don't want to test what you don't control), you have to find some other way to authenticate against Auth0 without redirecting away from your application. That's where the Password Grant comes in. The Password grant relies on authenticating a user via provided username and password credentials. OK. You have created your Cypress Custom Command for login. Also, you have configured your Auth0 account and you have updated your Cypress environment variables. Now, you will see how you can take advantage of everything you've done to log into Auth0 programmatically using Cypress! This will make the Cypress dashboard open. 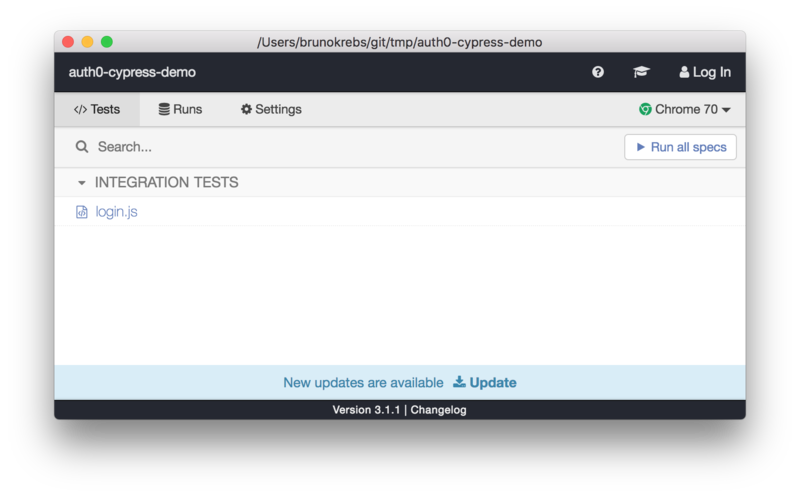 From there, you can click on the login.js integration test in the Cypress test runner. You should now see an instance of Chrome launched, with your user automatically logged in to Auth0! Click on the Profile page to see your logged in user's email address for verification. "I just learned how to perform end-to-end integration tests on SPAs secured with Auth0." In this article, you started by learning about one of Cypress' core tenets when it comes to testing: avoid testing sites over which one does not have control. Next, you took a quick look on Cypress Custom Commands and how they make your lives easier by encapsulating repetitive testing logic. Then, you learned about Grant Strategies, which are methods by which you can gain access tokens. More specifically, you learned about the Resource Owner Password Grant strategy, which allows you to receive a token by providing username and password credentials, thereby circumventing the need to visit the Auth0 login page. Note: Keep in mind that you must not use this grant on your public clients. This is an exception to this rule because it is an end-to-end test that won't be used by real users. 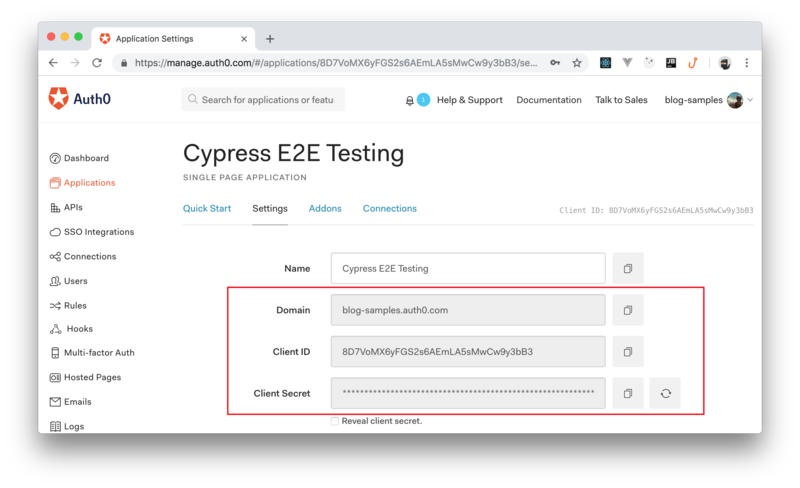 Finally, you learned about how you can use your custom login command in a test, set your access token in memory, and successfully log into your application as part of your Cypress test. I hope you've enjoyed reading this article, and have gained an understanding of how you can incorporate Cypress into your Auth0 application. If you have any questions or concerns, please feel free to leave a comment down below.